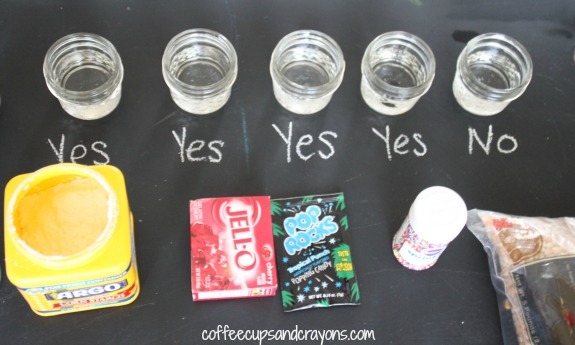 Today’s science week theme is liquids and we have a fun water activity for you! We experimented to see which solids would dissolve in water and the kids loved finding out if their predictions were correct. 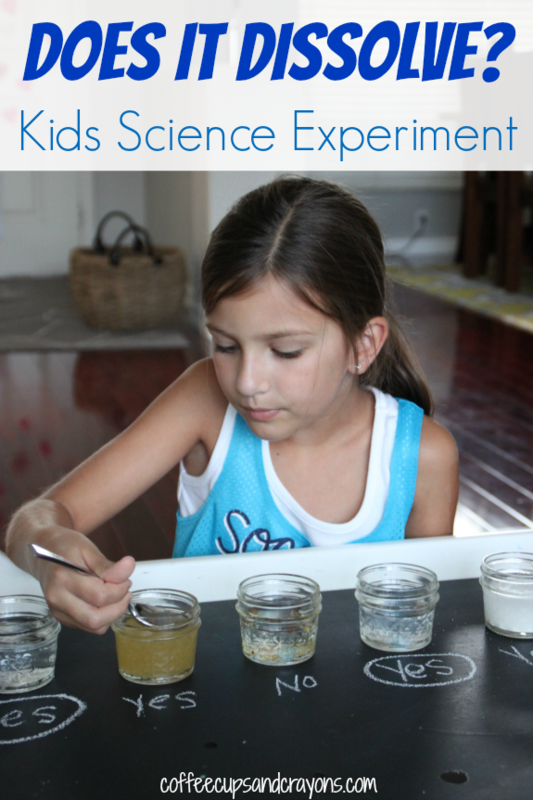 There is something extra fun about any science activity where you get to mix things! I told the kids what we were going to do and they raided the pantry to see what items we should test. They predicted whether or not each solid would dissolve in the water and had some really great discussions with each other about their reasoning. Then it was time to experiment! 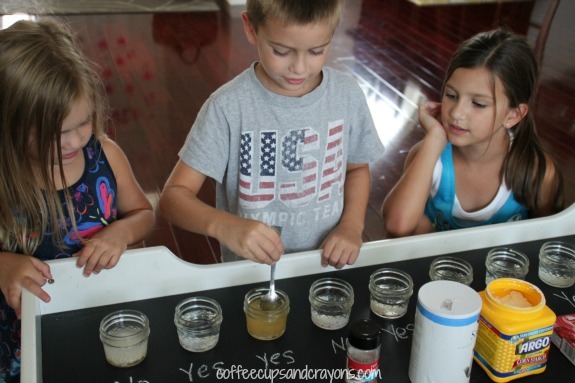 They loved mixing each ingredient into the water and observing the results. They couldn’t wait to see if their predictions were correct. That’s the reason to do these kind of science activities with young kids. It’s not important if they can remember if garlic powder or Pop Rocks dissolve in water. It’s that they are developing observation and problem solving skills while building self confidence and an affinity for learning. 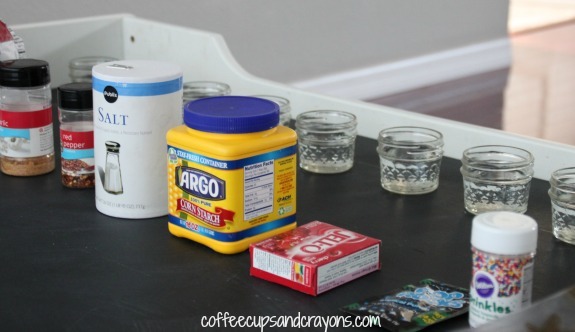 We are having so much fun participating in a week’s kids science activities with Mom to 2 Posh Lil Divas, Inspiration Laboratories, and Learn Play Imagine. Make sure to see our Make a Cloud in a Bottle activity from Monday and come back on Friday to see what we do with flowers! Great experiment, Megan! We’ll have to try this, but I think ours will be slightly messier 🙂 Love your table, btw! Ha! We used to do this one outside! What were all the ingredients you tried to dissolve? Thanks so much! We just used items we found in the pantry–flour, garlic powder, crushed red pepper, cornstarch, Jell-O, Pop Rocks, and popcorn kernels. Anything you have will work! I am doing this project for are school science fair! I think I will get first place!